Communique from Southern Fried Science contributor Megumi Shimizu. Scientists with Stories is a collaborative project by PhD students affiliated with the Duke University Marine Laboratory (DUML) and the UNCʼs Institute of Marine Sciences (IMS) to help young scientists develop the skills needed to communicate mediums of communication: digital photography, web videography, podcasts, and blogging. We have successfully achieved intensive filmmaking workshop in this summer, and going to have film and photography exhibition in UNC Chapel Hill on November 29th and 30th. There are two ways to join our Festival. First, you can submit your works in film, photography and audio to our Exhibition (Duke and UNC students only). Please see our website today and contact to Rachel Gittman, one of our student leaders to tell that you are submitting. 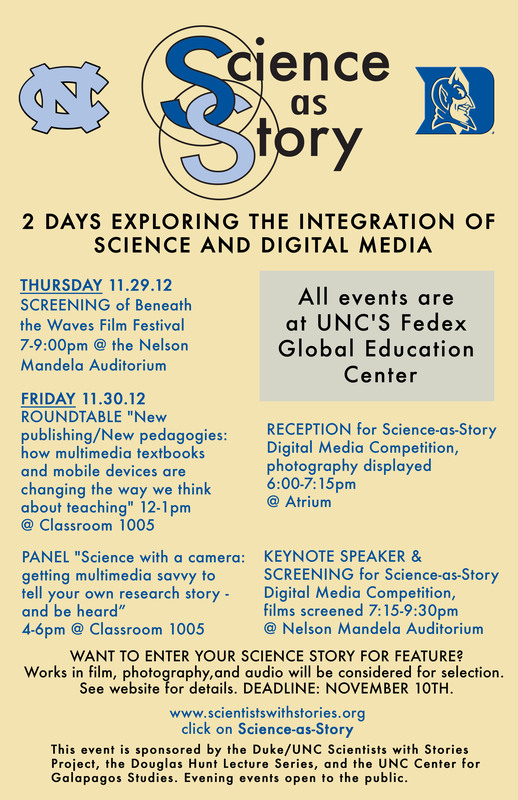 Second this event is open to public, please visit UNC’s Fedex Center for Global Education. We have keynote speakers, film screening in addition to our exhibition. Details in below.